No matter what experience you have as a Golfer there are opportunities out there for you to experience the thrills, frustrations & excitement that golf in the Southern region can provide. Here are some suggestions. The Southern Scenic route is well publicised & with short deviations from the main road you will find golf courses like Owaka, Tokanui, Riverton, Tuatapere & the highly under-rated eighteen hole Te Anau course. All the mentioned courses provide a different experience & some of the scenery is well worth the $5 plus you are expected to pay for the view, not to mention the hospitality. The larger towns all have an eighteen-hole course nearby & the majority of these courses have subtle differences to give each one the character & challenge golfers look for. If you start in Dunedin you have the choice of Balmacewen, St Clair, Chisholm Park & Taieri. Further south you can try the Balclutha course or carry on to Gore & test your skill & see if you can par all the testing par threes. Invercargill has four eighteen hole courses to choose from & the difference in layout is again well worth checking out. The Oreti Sand course near Foveaux Strait always provides a stern test. Thirty kilometres north of Invercargill is the Central Southland town of Winton with an eighteen hole course that will once again give any golfer a stern test. There are a number of nine hole courses in the Central Northern Southland area & all offer their own character that you may wish to check out. Te Anau has already been mentioned but it deserves more. The views this course offers of Lake Te Anau, Mount Luxmore & the surrounding Fiordland National Park are well worth the reasonable green fee you will be asked to pay. Once you have satisfied your appetite of Southland Courses why not head into the Southern Lakes area & check out some of the great courses this region has to offer. It will be slightly more expensive to play most of the courses here & it would also be wise to phone ahead to book a tee off time on the more popular courses. Once you sight Lake Wakatipu at Kingston turn left off the main highway & have a look at the Kingston Course with its interesting layout and own beauty. The Queenstown Golf Club at Kelvin Heights is widely promoted as having some of the best views of any course in New Zealand, form your own view while paying it. Millbrook has the South's longest championship course. 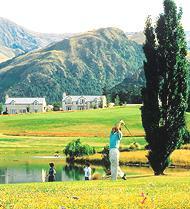 If you don't want to wait for a tee off time, have a look at the Arrowtown course nearby. Cromwell is an enjoyable course to play & will reward straight hitting golfers. Wanaka, Alexandra, Roxburgh & Dunstan are all well worth checking out. Central Otago has a very special climate & the courses in this region benefit from the summer heat & the good irrigation systems most courses now have. 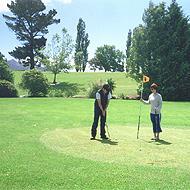 As a result there are many opportunities along the Otago Central Rail Trail for golfing enthusiasts. If travelling through the Waitaki Valley to or from Oamaru, try out some of the courses along the way - the scenery alone is fantastic and justifies the time. No rules have been changed for 2009. However, it still makes sense to refresh your memory about the most important rules at the beginning of the new season. In our bookshop on www.golfrulesmadeeasy.com you will find two publications – quick reference and in depth guides – which are ideal for this purpose. Our books are now available throughout the entire world, in more than 20 languages. We are delighted to be a preferred partner of one of the largest golf federations of the world, the German golf federation (DGV). We view this cooperation as recognition and as motivation to continue to develop the best and most easy-to-understand rules products for our customers.